Pints of Peonies: RAINBOW PANCAKES!? 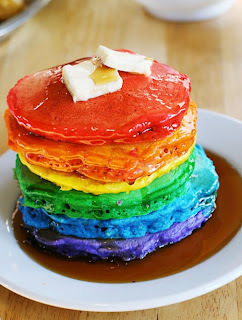 Thank you, thank you Taryn Cox for introducing me to the amazing concept of RAINBOW PANCAKES! They are beautiful, look surprisingly scrumptious (considering the unnatural multi-colored hues) and I am just dying to dig in!